Nothing prepared me for the beauty I would see on my recent trip to Alberta in Canada recently. Seriously. 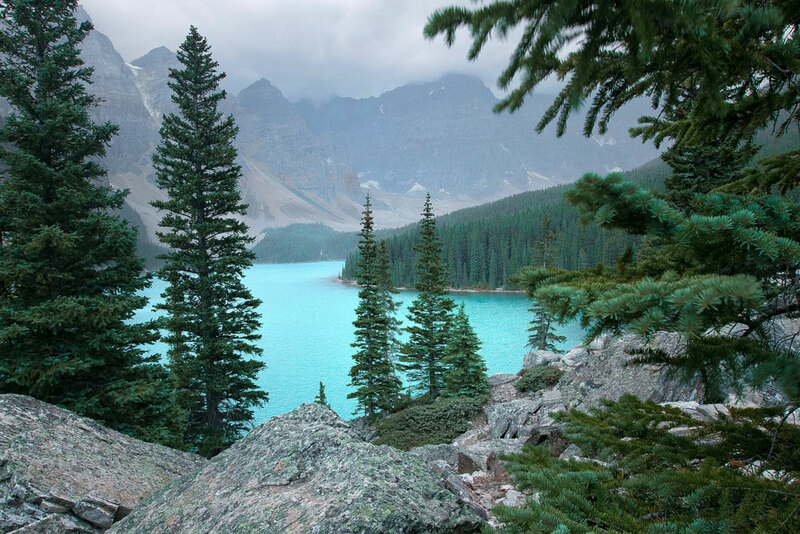 I had heard Canada was gorgeous, but I had no idea Moraine Lake, Lake Louise and Peyto Lake were absolutely gorgeous. For anyone who plans on travelling to Canada, whether for leisure, pleasure or business, it would be a crime not to visit these three lakes. All located within driving distance of each other and so close to the gorgeous town of Banff, which might I add looks like a Christmas snow globe IRL, it’s very easy for anyone with a (hire) car to knock these lakes off their bucket list in a day. In fact, if you are time poor and want to visit these three lakes in Canada below is my quick suggested itinerary. Moraine Lake Start early and get to Moraine Lake, which is located approximately 55 minutes northwest by car from Banff. There are three reasons for getting to Moraine Lake this early in the morning – to watch the sunrise over the lake and to get a decent car park. There aren’t a lot of spots in the main car park so don’t even bother thinking of visiting in the middle of the day when everyone fights for a spot all the way up the road. When you arrive, walk up and around the lake and take in the view from the many different aspects available. If you’re lucky and the sun is shining, the water will be a magnificent azure blue. But even when it’s overcast, the water is still very striking. Lake Louise Next up drive to Lake Louise, which is literally down the road or 15 minutes by car. To avoid the chaos of tourists who start arriving by the busload from 9am; easier said than done when all you want to do is take your time and enjoy Moraine Lake. Up to you! Luckily the car park is bigger at Lake Louise but you won’t get a spot after 10am. After you park the car, take your time and walk around the lake. If you have more time than a day, I highly recommend taking one of the many hikes surrounding the lake where you can get a better aspect of the famous Fairmont Chateau situated lakeside. The water at Lake Louise is truly beautiful and it gets its tiffany blue colour from the powdery flour produced by the rocks in and around the lake. If you walk to the waters edge, you will notice the water is crystal clear and you’ll be able to see tree logs and rocks sitting happily in the water. Book ahead and hire a canoe to circle the lake on water for an hour. The rich red canoe’s make for an epic photo. In fact, I dare you not to take hundreds of photos! After your millions of selfies, grab a coffee from the (very expensive) café at the Fairmont Chateau and snacks – you’ll need them for the journey to Peyto Lake as there isn’t anything available to buy once you get onto the Icefields Parkway. I might also mention this road is closed in the peak winter months, so if you want to see Peyto Lake travel to Canada from March to October. Peyto Lake Saving the best for last! When someone asks me where my favourite place in the world is, I now answer with Peyto Lake. It is by far the most gorgeous lake I’ve ever seen and I was having a full on #naturefroth for at least two hours when I explored the area. It’s located another 40 minutes northwest by car from Lake Louise, but I can guarantee you it’s going to take a lot longer than that. Lucky for you, the drive to Peyto Lake means you get to drive along the Icefields Parkway, arguably the most stunning highway in the world. And I agree. When you get to the turn off for Peyto Lake, there are two car parks. The first one is for general visitors, and the second is for buses and disabled parking. On the day I went, it was pouring with rain and I didn’t have an umbrella so I decided (unknowingly) to check out the top car park. When I got up there the rain stopped and the car park was empty, so I turned the car off in a spot for buses and ran down to the viewing platform. I think however on a busy day you wouldn’t be able to get away with this if you weren’t a bus or required disabled parking. No words will ever do Peyto Lake justice, so I hope you enjoy my photos below! However, to think I almost didn’t get out of the car to see this lake because the rain was so heavy. For obvious reasons I’m glad I did because the lake is otherworldly to say the least. If you have time, do hike around the lake and surrounding area. I had no idea I could do this, but I was running out of time so I wasn’t able to anyway. But if you do have a few hours to kill, make sure you do more than stand at the viewing platform.